Boolog - It's all about the boo.........................Booray's Blog: What's wrong with me? Tonight, Bobbi and I watched the news to get the whole story on what happened with those miners that died. Such a tragedy, made worse by the false information that lead everyone to believe they were alive. Certainly not a laughing matter. 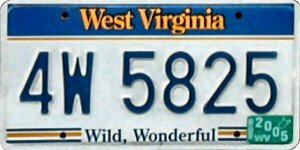 Which is why, when a grief-stricken woman woman told a reporter, "We're from West Virginia.... we're dumb but we love our family," I really shouldn't have looked at Bobbi and said, "They should put that on the license plates."